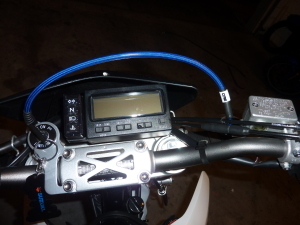 I just installed the Trail Tech Vapor (752-301) onto my 2014 Suzuki DR-Z400SM. 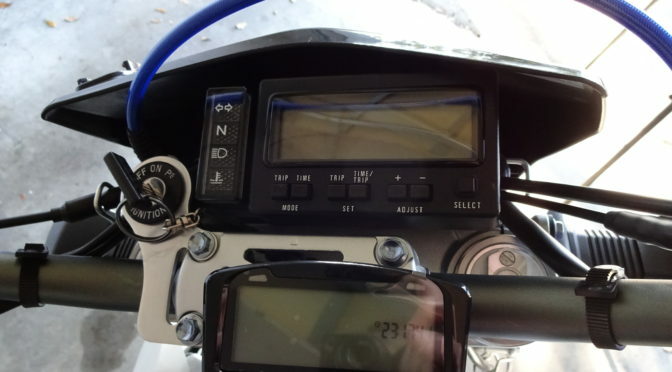 At about 3300 miles, the stock speedometer stopped working because Suzuki decided to put a piece of plastic garbage on to act as the speed sensor. 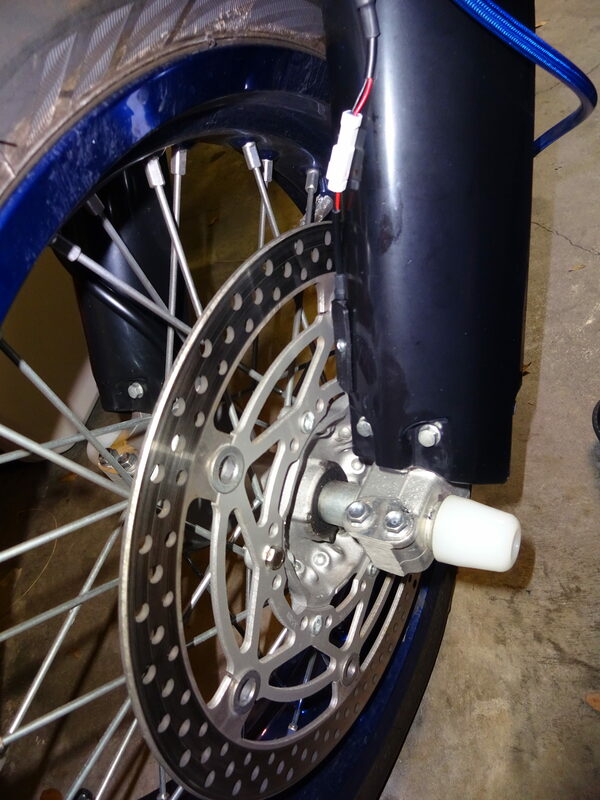 Luckily, the Trail Tech uses a much more reliable magnetic wheel sensor instead of a plastic gear. That was the main driving force behind this purchase and installation, but the tachometer was a nice added bonus (the stock DR-Z dash does not include a tachometer and is very basic). I should note that the Vapor does not come with indicator lights for turn signals, high beam, coolant temp, neutral,etc by default, but can be added with an add-on unit. I haven’t installed the add-on unit at this time. I will go over the different hook-ups and sensors individually. The Vapor needs a constant 12V power source with a 1A fuse in the circuit. Luckily, the stock dash has a 3 wire connector that powers the unit. I was able to simply disconnect the plug and cut the harness off of the stock speedometer. It has 3 wires: red, black, and orange. The red is the 12v power, black is ground, and orange is key-on power. I simply spliced the red and black Vapor wires onto the red and black wires of the harness, ignoring the orange wire, which worked perfectly and gave me a nice clean harness to plug into. 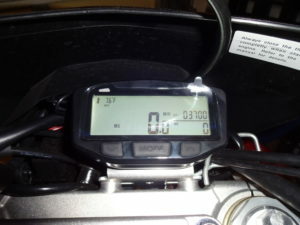 (Requires removal of gas tank) The RPM sensor is a single wire that is red at the end. 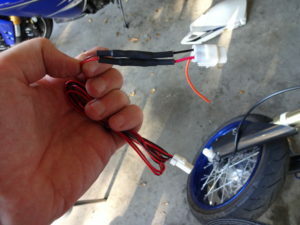 Simply coil the red part around the thick black spark plug wire 6-12 times. I ended up with about 10, then wrapped it in electrical tape to keep it in place. This is good enough for the graph portion of the tach to be functional, but I have the issue where the digital numeric readout jumps back and forth from actual to low at every other reading. I will likely splice the wire into the spade-connector at the spark plug for a more accurate reading in the future, but it’s good enough for now. The speedometer sensor is a magnet that gets installed on the rotor and a sensor that picks up the magnet at each revolution. I used the shorter of the two included magnetic rotor screws to replace one of the stock rotor screws. Now, the manual suggests drilling into the front brake caliper bracket for the sensor mount. 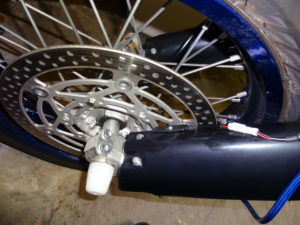 This does NOT work for the SM model because the front rotor is larger for street use. I don’t have an S or an E model, so I can’t confirm if it’s a good spot for those. Anyway, I just drilled into the front fork guard instead at a point that would be close enough to the magnet as it passes. There are two versions of the radiator sensor for the Vapor. I got the 752-301 model specifically because it uses a screw that simply replaces the pressure relief screw in the radiator and doesn’t require any cutting of the radiator hoses. When replacing the screw, remember not to overtighten it as it is a hollow brass screw that can break easily. The manual recommends finger tight plus 1/4 turn. I can confirm that this mounting location DOES work on the SM model even though many configurators say it doesn’t. That’s all, it was a pretty simple installation once i got a few of the unknowns worked out. The manual offers very good instructions for initial setup of the unit. I used 1 Pulse per Revolution and 1884mm as the wheel size (not confirmed, but i will double check later if it’s accurate). 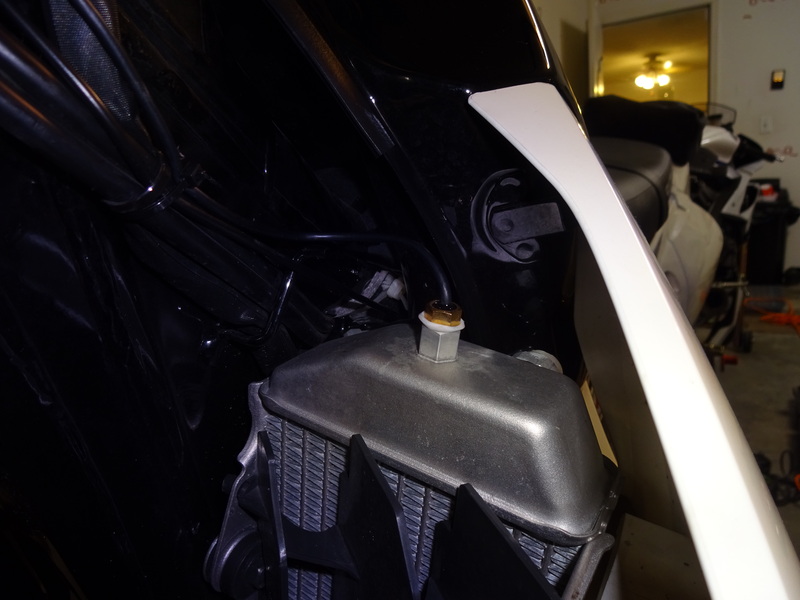 And, when reconnecting the gas tank, remember that there are TWO hoses to reattach. That second smaller one is easy to miss and forget. My bike wouldn’t hold idle for more than a couple seconds because I forgot to reattach it. I wound up removing and cleaning the carburetor because I thought I may have gotten something in the line, but it was just my stupidity and forgetting to connect the secondary hose. I hope this write-up and video were useful. Feel free to ask any questions or post comments in the comments section! There’s the simple answer, and then the slightly more in depth. The simple: I like Yamaha. 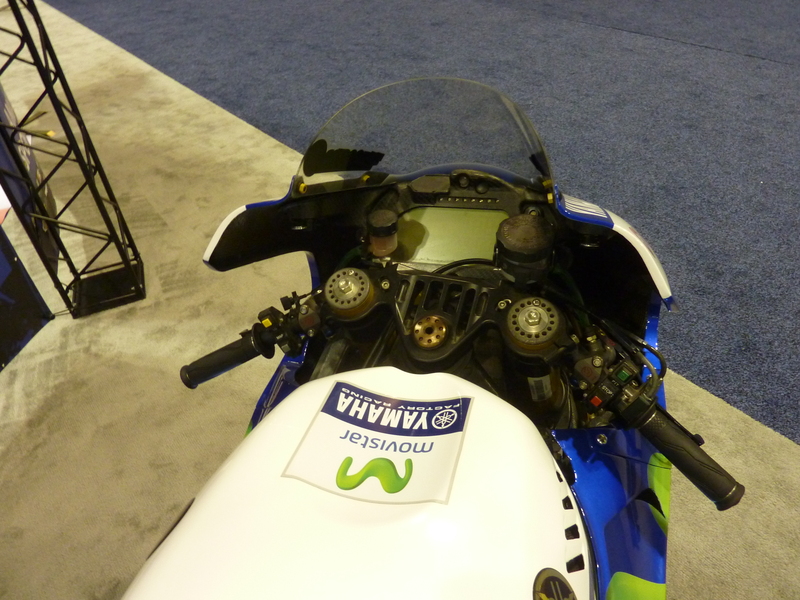 I used to go to the track on my 2009 Yamaha R1, but quickly learned that I wasn’t actually learning with all of that power. It was simply too much to really get a good grasp on what makes a good track rider. For instance, I could simply put the bike in 3rd gear for the entire track and run my maximum pace. That’s great if you want to shoot down the straights and pretend you’re good, but I wanted something a bit more manageable. Something that I could switch gears on throughout the track, that I could brake and accelerate, and that I could flick around a little more crazily…also, something that was a little lighter on consumables like tires, oil, brake pads, etc. So I knew I wanted a 600. My end-game is to race. I may have even been a bit hasty with the 600 as there are plenty of 300-500 race classes that are more noob-friendly, but 600 is where I landed. I am a long time Yamaha fan, so the R6 was the obvious choice for me personally. The other 3 Japanese 600s are also great options of course, you can’t go wrong with any of them, but Yamaha holds a special spot in my heart. I kind of surprised myself with how quickly the R6 route presented itself. I signed up for a trackday in May 2015, but only got the bike in April. 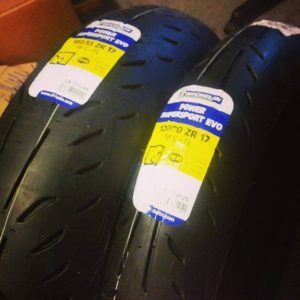 So I was fully prepared to do one last trackday on the R1, even bought some new tires (which still sit in my guest room unused!). Anyway, the Florida rain kicked in, like usual, and delayed the day until June. 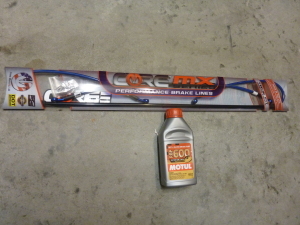 This just happened to give me enough time to get my 600 mile service in, get my “New Bike Package” installed, including Core Moto stainless braided brake lines, Engine Ice coolant, Motul RBF600 brake fluid, and Motul 300V oil. I was all set, but unfortunately I didn’t have time to replace the tires, so I used the stock Dunlop Qualifiers that came with it. It was mostly successful, I had to push a little harder to match my R1 lap times at JenningsGP, but I eventually did, and pushed those stock tires pretty hard (or so it seemed). The big take-away was that I definitely made the right choice. The R6 was a joy to ride at the track, and left room for improvement and also was forgiving enough to accompany some mistakes along the way without punishing me for some overuse of the throttle. Up next: Track day 2 on the Michelin Pilot Supersport Evos, and first time with tire warmers. 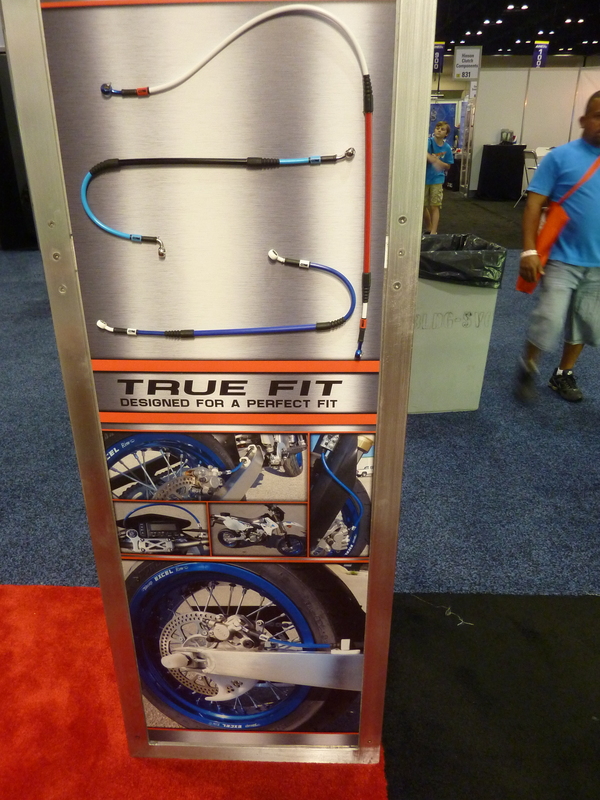 One vendor I was particularly looking out for at this year’s AIMExpo 2014 was CoreMoto, primarily known for their custom brake lines. I have heard many positive reviews from different people, and being from Florida, many residents choose CoreMoto because they are local. 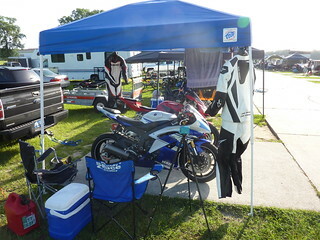 I even had the opportunity to meet the owner during Bike Week a few years ago and he was very interested in building and selling a great product, not just another knockoff of what works. 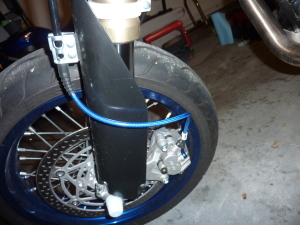 Brake lines are pretty simple. The OEM lines are generally rubber which allow flex and expansion of the lines and ultimately leads to performance degradation over time. Stainless steel braided lines don’t expand under pressure and offer a more linear feel throughout the pull. They are simply more predictable and reliable. 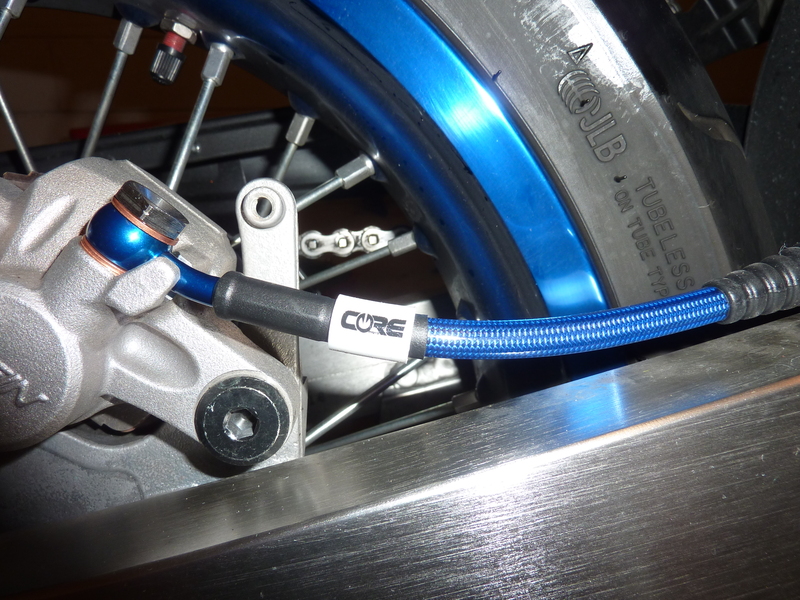 Other than just using good materials, it’s difficult to make a brake line that stands out from the crowd, but CoreMoto manages to do just that. With a huge assortment of color options for the fittings, logo tags, and brake lines, you get to have your choice of exactly how they will look and match your bike’s color scheme. I have Goodridge lines for my R1, and they are a good quality brake line, but that’s where it ends. CoreMoto adds all of the extra line stiffeners, rubber fittings, etc to make them fit properly for your specific application. 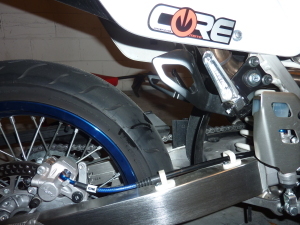 I recently fitted them to my 2014 Suzuki DR-Z400SM supermoto after seeing that specific application advertised at their AIMExpo booth. It looked great in the picture, and looks great in person as well. 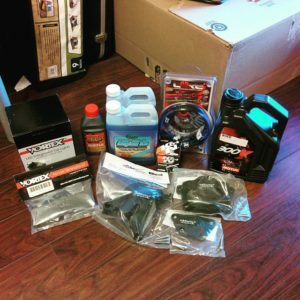 They shipped in a long package due to the front line stiffener for MX based motorcycles, and included all necessary hardware…and a few stickers. (I don’t know why anyone doesn’t add free stickers to every item sold). The instructions were complete and even showed how to adjust the fittings properly (without voiding the lifetime warranty) if they didn’t quite line up, but mine did so I had no issue. After installing the lines and filling with my personal favorite, Motul RBF600 Synthetic DOT 4 Brake Fluid , I was ready to test them out. I was instantly impressed. 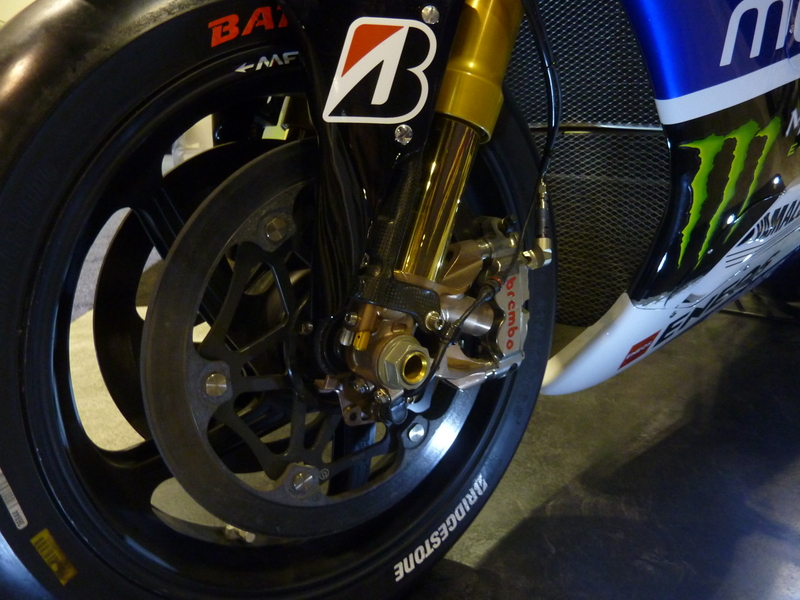 Both front and rear brake feel increased considerably, as expected, over the OEM rubber lines. No leaks or imperfections. A great looking and great performing product from an American company. 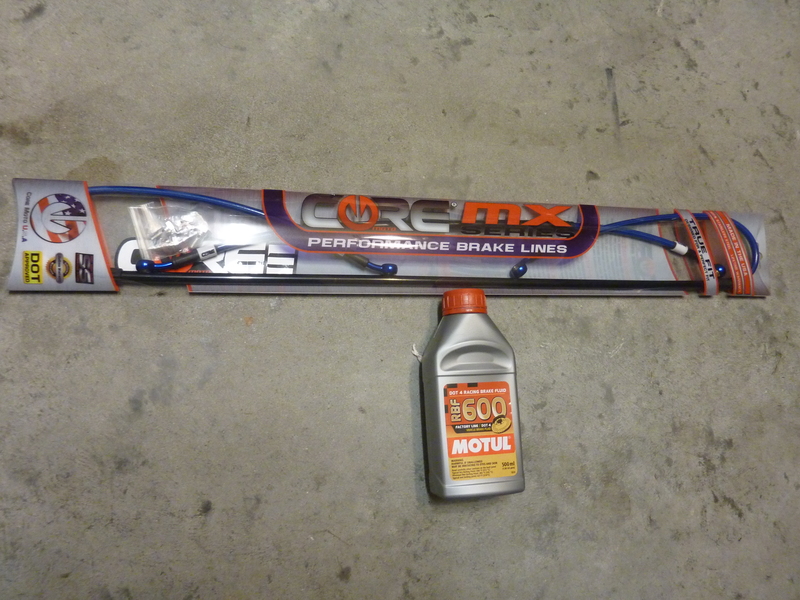 I certainly recommend CoreMoto brake lines when considering your next purchase, you won’t be disappointed! One of the greatest sights at any expo, convention, or race event is the opportunity to see the pure racing machines up close. The ability to take in every nuance of the machines from any angle you want. Not just restricted to the views given by TV and print coverage. Especially the GP prototype bikes that you can’t simply go to a dealership or a track day to see a similar setup. Though they may not be the machines that are currently being ridden by the associated riders, they are probably a previous year’s model or a very close replica. Either way, you can still see the same exact parts that are on the track with the current running setups. The GP bikes are certainly a sight to behold for any race fan. 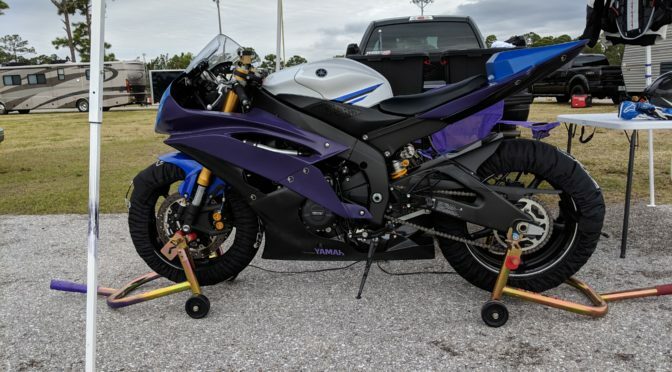 Being an R1 owner myself, I personally love to see what modifications the teams make and what might be available to install on my own bike. 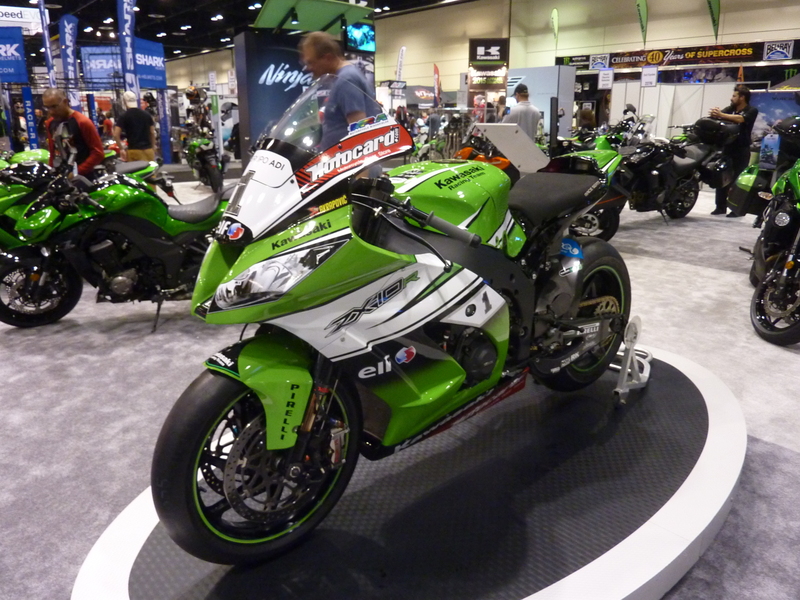 Unlike MotoGP, Superbike and Supersport series rules generally keep the motorcycles moderately close to the bike you can purchase from the showroom floor. Of course they have a ton of development and fine tuning, but most components can be bought by anybody for the right price. Josh Hayes is a dominant force in American roadracing, so it’s always great to see what he is riding. Last but certainly not least, the Kawasaki ZX-10R of Tom Sykes, the reigning 2014 World Superbike champion. 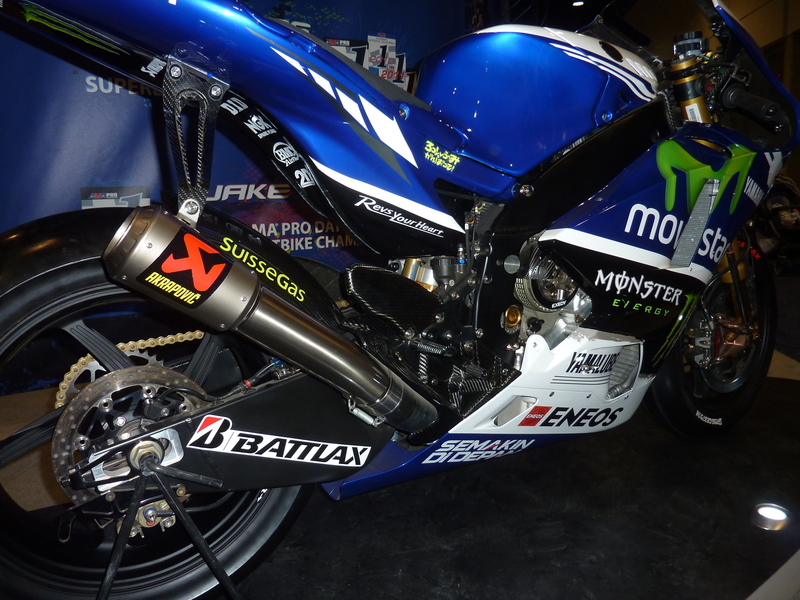 World Superbike is the top series that still races homologated motorcycles that are based in the showroom customer models. 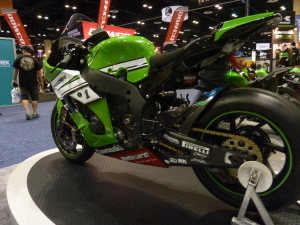 As my favorite race series to watch due to the close and competitive nature of the teams, I was happily surprised to see the ZX-10R race bike on display. 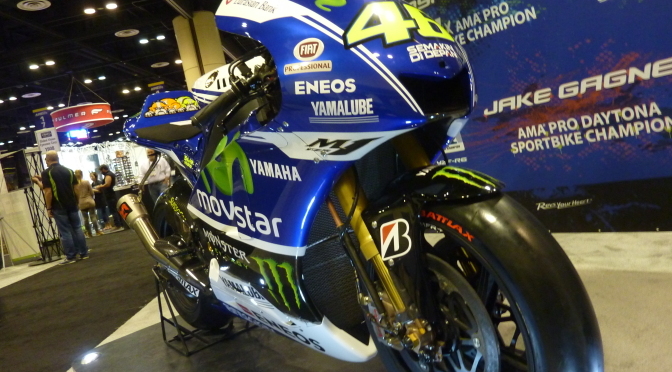 Valentino Rossi is arguably the most popular motorcycle racer in history, so of course his bike is always a crowd pleaser. And Josh Hayes is the current American series champion, so it is locally relevant. But World Superbike is not as popular in the United States unfortunately. Hopefully that will change soon because the races are certainly exciting, plus we have an American race at Laguna Seca in California to see them up close in person. Unfortunately that was the extent of the official race machinery at the AIMExpo this year, but it was a great improvement and increase in manufacturers over its inaugural year in 2013. Whose bike would you like to see up close? Let us know in the Comments below! 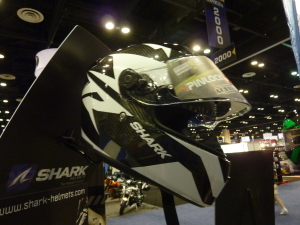 I first tried on a Shark helmet at the 2013 AIMExpo and immediately became interested. I was in the market for a track/sport helmet that I could use day to day with good degree of comfort without sacrificing safety. 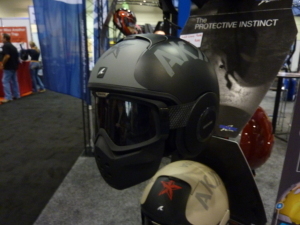 I thought I would be most interested in the Arai Corsair V but just wasn’t impressed after trying one on. The inside felt very hard and didn’t seem like it would be comfortable over an extended period of time. Then I tried on a Shark Race-R. It was both light and extremely comfortable. The XL fit my head shape perfectly, snug but comfortable. Additionally, the padding felt plush like a pillow. Between the weightlessness and the liner, I simply fell in love. At $649 MSRP, it is a bit expensive but is still cheaper than the Corsair V and is a top quality helmet. Another distinguishing factor is the 2.2mm thick shield. It is noticeably thicker than most other brands and gives confidence that it will stay intact in the event of debris hitting at high speed or on impact. Other top brand shields start to seem a bit too thin after experiencing the Shark. 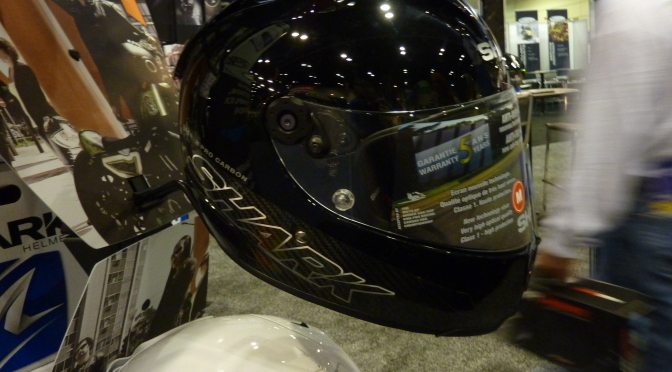 For a street/track helmet with more focus on street, the Speed-R is also a great option. 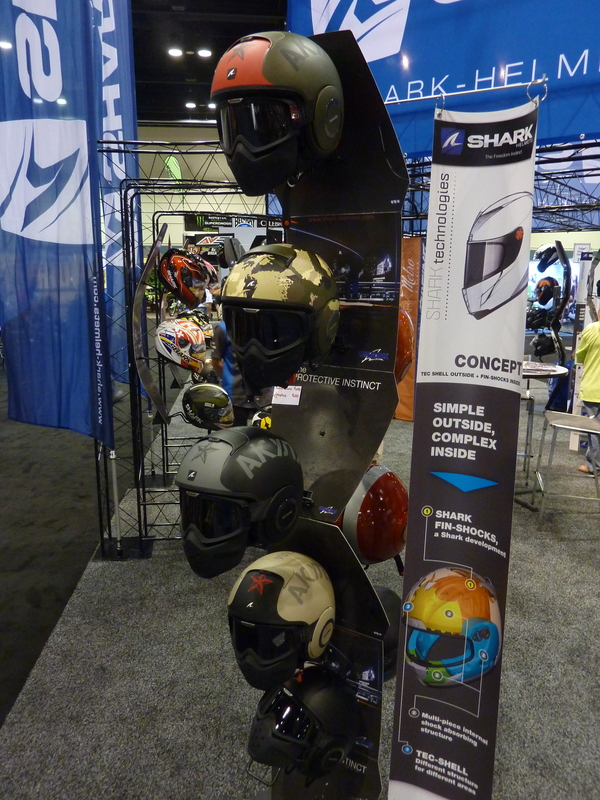 Like the Race-R, the Speed-R is a top tier helmet with a few extra street friendly considerations. Foremost is the built in sun-visor. A slider on the top of the helmet pushes down a tinted internal visor that resides within the shell when not in use. As someone who often rides over the transition from light to dark and has to decide which shield to attach constantly, this would be a welcome option. There is not as much aerodynamic plastics on the Speed-R, and the helmet is a bit heavier, but still very light. Both the Race-R and Speed-R have DOT and ECE 22.05 certifications. And finally, the last helmet that I focused on at the Expo was the Raw. The aesthetic is great and looks like a fighter pilot helmet. It is the type of helmet I’d love to wear when riding my supermoto on the street, but I also feel I’d need to acquire other matching gear to really fill out the look. Unfortunately, as fun as this helmet is, it is not as comfortable as I hoped. The goggles and lower plastic mouth cover put pressure right around the nose and seem like they’d bite in and become more uncomfortable over time. I just don’t think the sacrifices necessary would be worth the look, yet a part of me still wants one of these just to have on display. Conclusion – It will be my next helmet! 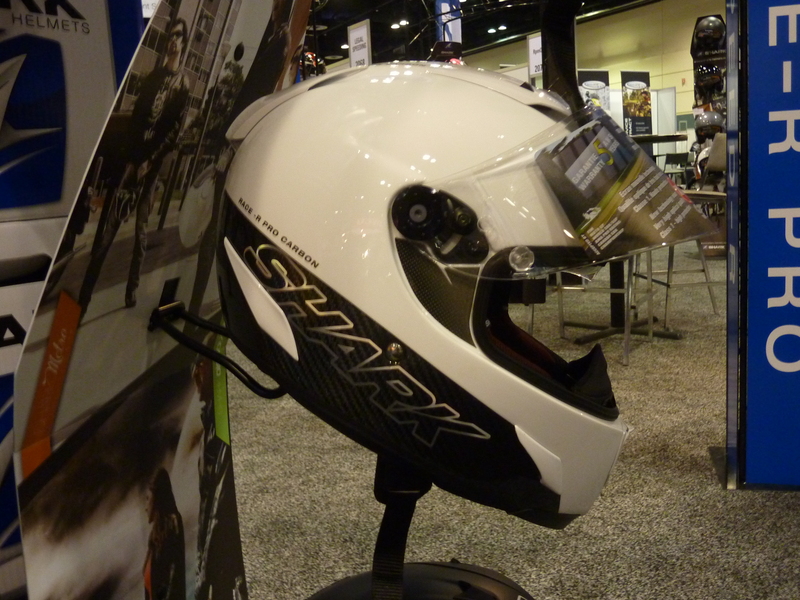 If it’s not obvious, the Shark Race-R or Speed-R will likely be my next helmet purchase. I can’t express enough how great the helmet felt to wear, and I would love to be wearing one at my next track day to boost confidence (I currently have an Icon that runs a bit loose and lifts at high speed, which is a bit unnerving). Do you have any experience or impressions with Shark helmets? Let us know all about it, or your personal favorite helmet, in the Comments section below. It is a great time to be a new rider, at least if sport bikes are your thing. When I started riding, the options were pretty slim. 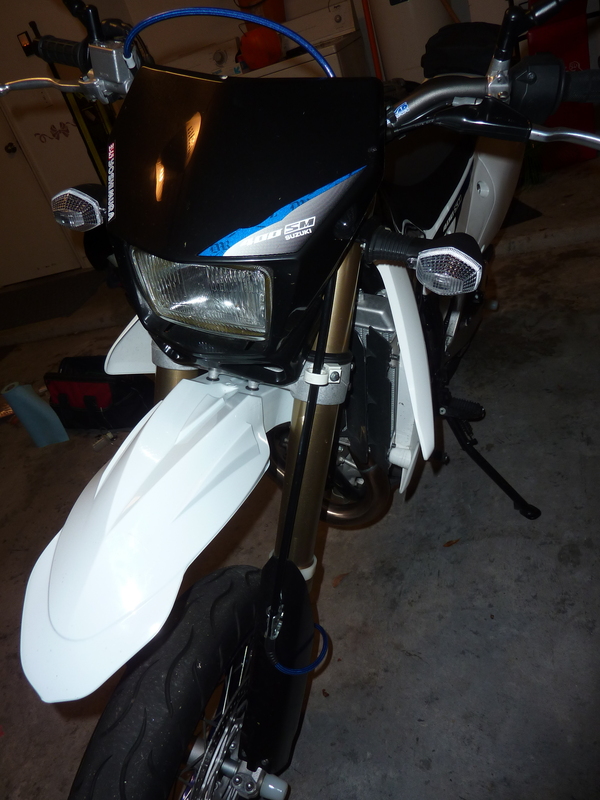 There was the Ninja 250 and EX500, both of which were very unexciting when compared to the 600 and 1000cc brethren. A few years later the Ninjas 250R got a pretty decent makeover and seemed much more sporty, but was still noticeably a small starter bike. 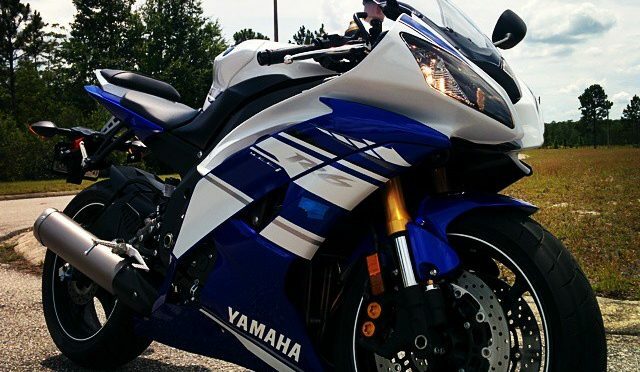 Some want the look of the bike to match their passion. Starting out shouldn’t be penalized with boring and unattractive options. Kawasaki finally nailed it with the Ninja 300. 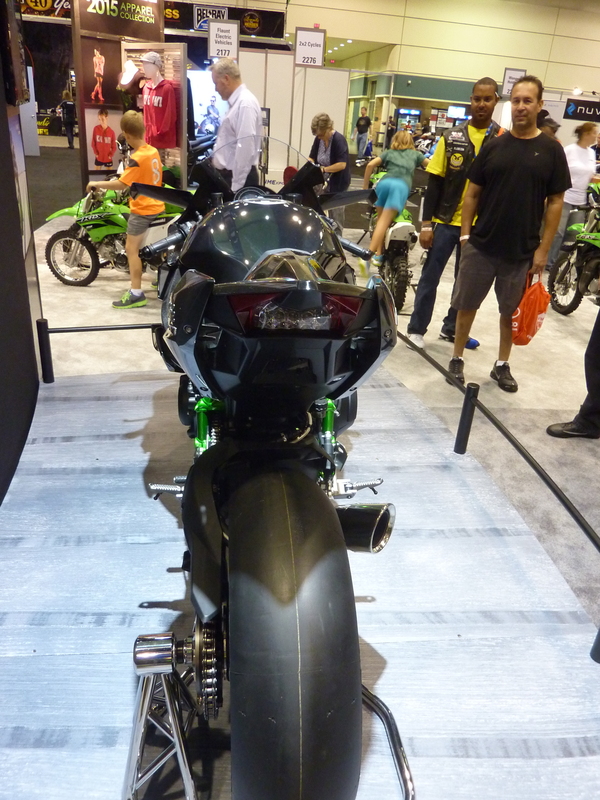 At a quick glance, it’s hard to quickly point out the differences between it and the ZX-6R and ZX-10R. They all share yearly color schemes and the general design shares an aggressive theme. A new rider no longer needs to be upset at their lack of options. 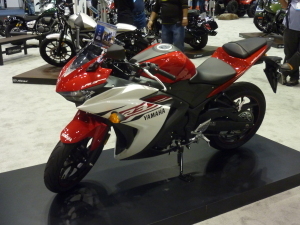 Recently Honda took notice and released the CBR250 and has the 300cc update coming soon. 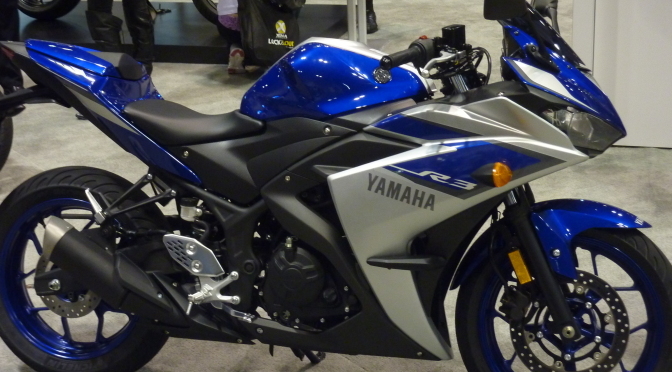 Now Yamaha and KTM are following suit to compete in the entry sportbike market. And the great news is that all of the bikes look modern and promise to offer great performance for the size. 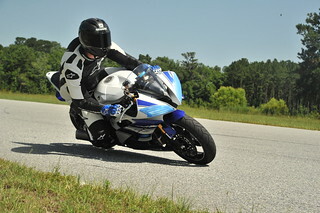 Heck, even seasoned riders are finding themselves excited by the new small displacement sportbikes. Not only do they look good, but they’re cheap and easy to handle for a blast at the track. Plus they offer a great value as a daily commuter getting 60+ MPG easily. I recently had the chance to check out the new Yamaha R3 at the AIMExpo in Orlando and it is a great addition to the “R” lineup. 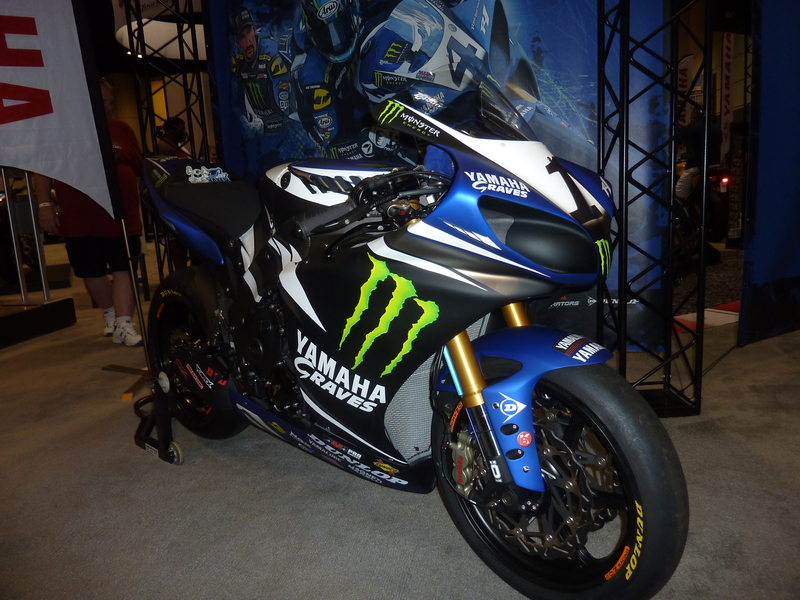 It will soon be overshadowed by the hinted R1 update for 2015, but is still a very exciting prospect for new riders. It is comfortable and lightweight, and the less aggressive ergonomics should be welcoming to those looking to pick up their first sportbike. 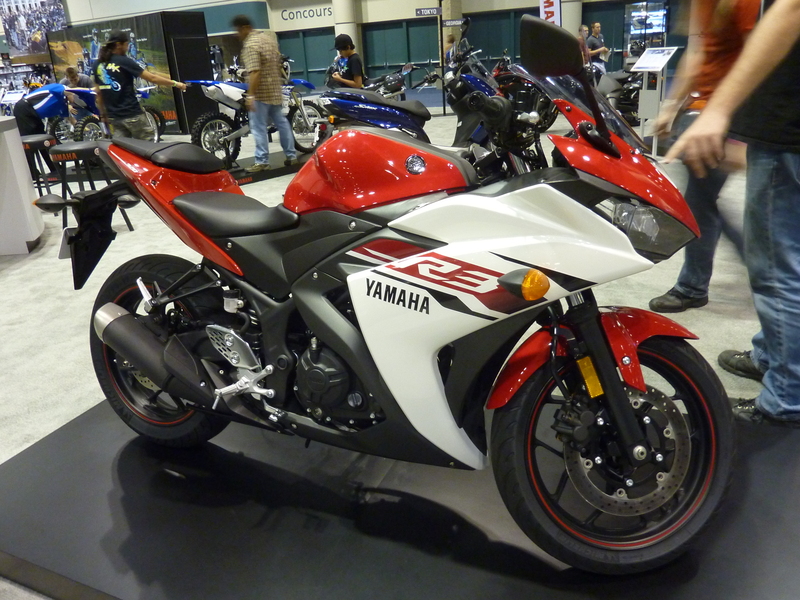 Plus, with the R6 and R1 inspired looks, they’ll also be able to blast around on a bike they can be truly proud to own. With all the great small displacement options, there’s been no better time to make the jump to two wheels and join in the madness! Kawasaki H2R: What Is It and Who Is It For? 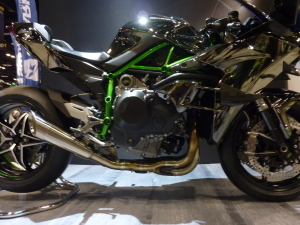 You’ve undoubtedly read and seen plenty about the supercharged dream machine from Kawasaki by now. I won’t go into numbers (OMG 300 horsepower) in this article, but will instead focus on what this bike actually is and who it is meant for. 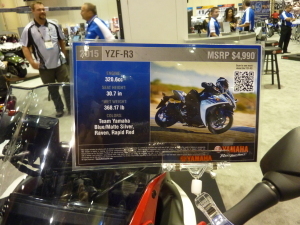 The numbers and specs are available pretty much everywhere at this point. 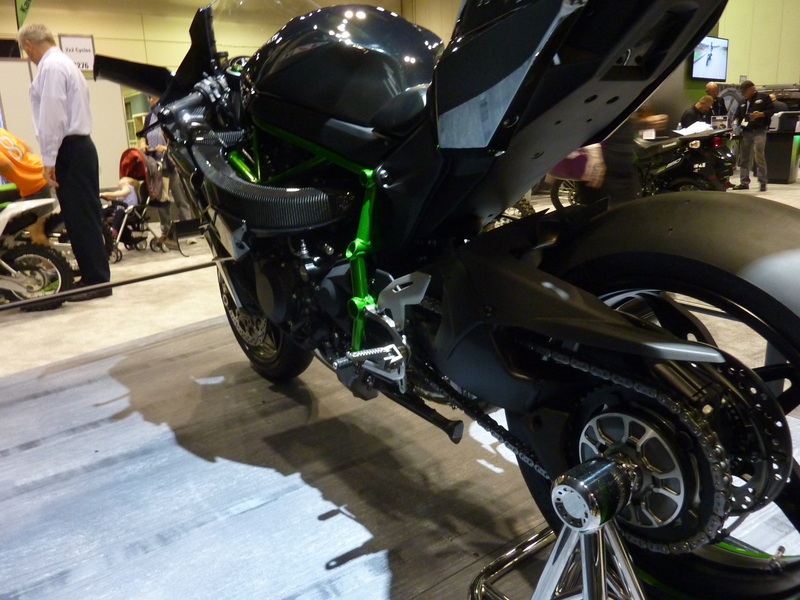 So to recap, the H2R is supercharged and not street legal AND it costs a speculated $50,000+. Of course it is a technical showcase. We will be seeing the street-going H2 in the coming weeks which will be a bit more accessible. 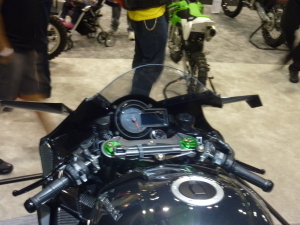 Kawasaki launched this bike with multiple teasers on a timed rollout. It was a marketing gimmick to drum up hype and it sure worked. And not only is it super-hyped, it’s not even something that most people can or would even want to buy, but it is a harbinger of greater things to come. 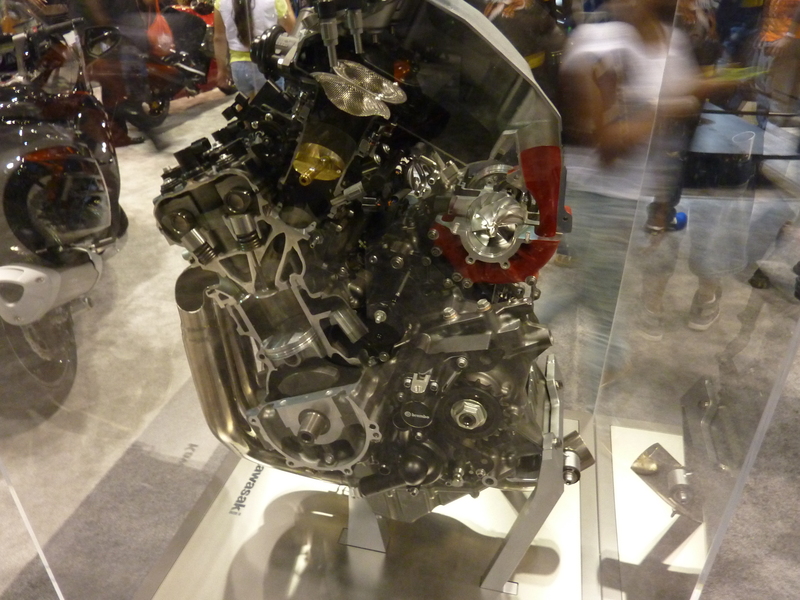 With an emphasis on emissions and gas mileage today, forced induction is making its way deeper into all motor vehicle markets. 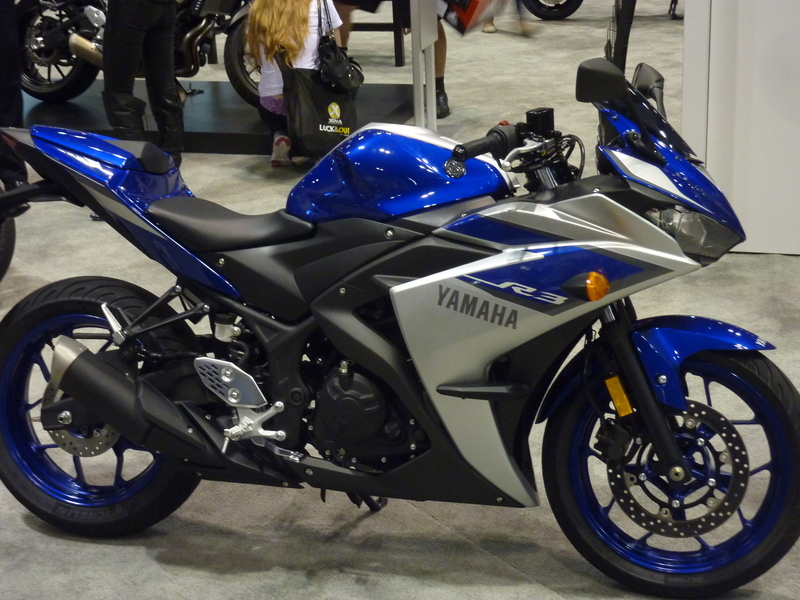 Kawasaki blazed the trail for the 300cc starter sportbike market, followed by Honda and now Yamaha and KTM. 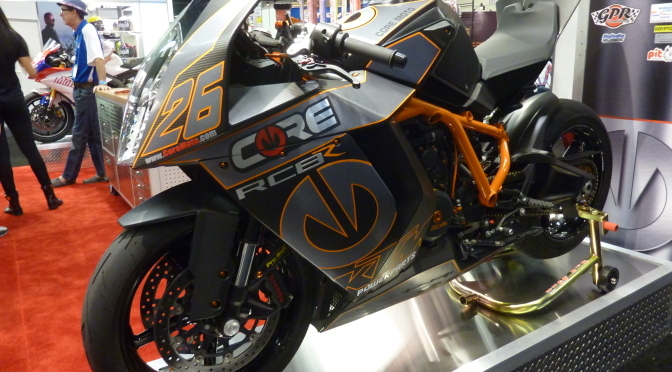 Perhaps they will also create a sweeping change in the superbike market as well with the supercharged literbikes. This is about as close to “exotic” or “supercar” as a bike can come at this point. Sorry to disappoint all those Ducati owners, but Italian doesn’t always mean exotic. The 1199 Panigale is a great bike, but it’s not a Ferrari or a Lamborghini. 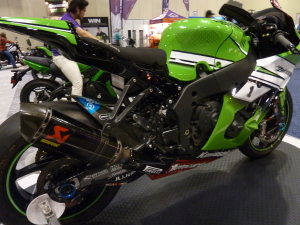 It’s a direct competitor of every other bike in the Superbike racing class (ZX-10R, YZF-R1, GSXR1000, CBR1000RR, S1000RR, etc). 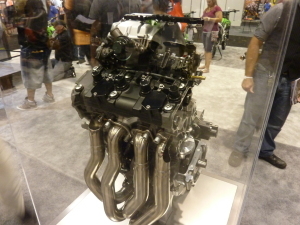 The H2R is an exotic. The market is almost non-existent and it doesn’t care. 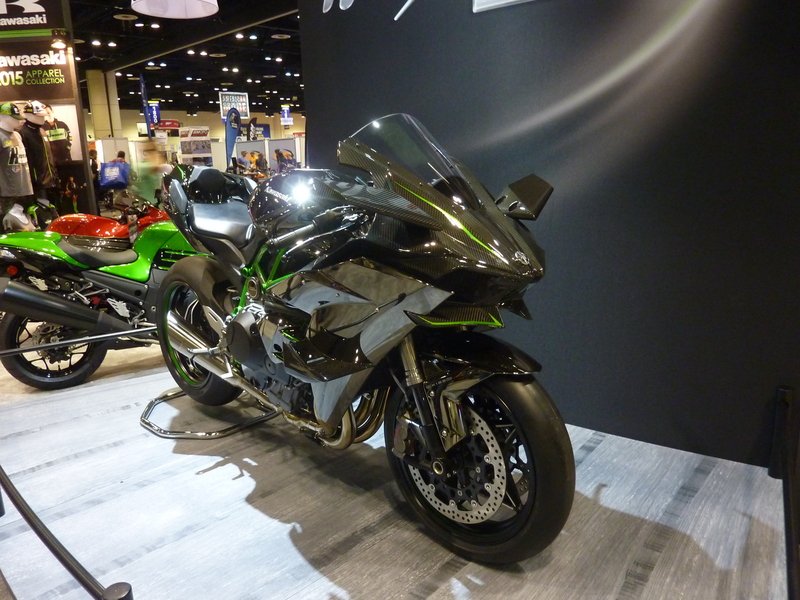 Kawasaki didn’t continue the straight-line horsepower train to further duke it out with the Hayabusa. The H2R has an appropriate wheelbase, a 1000cc engine, 17-inch wheels shod with slicks, and is made to work in the turns. It is built to compete on road courses but breaks all the class rules. At this time, there simply is no competition. We’ll have to hold for actual track times, but with all that carbon fiber and aerodynamics enhancements, I’m betting it will set some record laps. 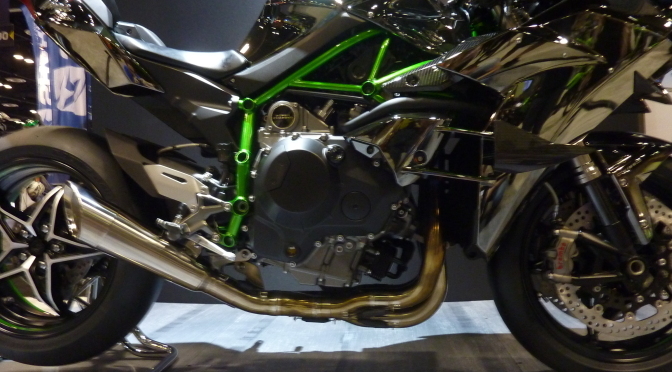 But who will actually buy the H2R? The people with enough money to dump on something they can’t even use on the street are generally the people who also want to be seen. You may see celebrities on the H2, but I’m doubting many will be grabbing the H2R. It’s not legal in any standard racing class, so even racers with big budgets won’t be taking their chances at the race track. With all those carbon fiber wings sticking out, you certainly don’t want to drop it (I’m picturing a similar sight to F1 cars exploding into CF shards once they go tumbling). So I can only imagine the answer will be a select few collectors and enthusiasts who have the disposable income to spend, but still have no intention of truly opening the beast up like it was truly meant to be ridden. Kudos to Kawasaki though for stepping out of the crowd and bringing innovation back into the sport market. Most others are plenty happy to fall in line and pump out urban warrior bikes because they’re hot and selling. 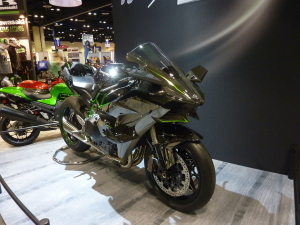 The sport market is lagging since the economic downturn and the excitement from the H2R is just what this segment needed to get some interest back. I can only hope this brings back the glory times of the early 2000s when new generation supersports were being released every two years just to keep up with the demand and competition. 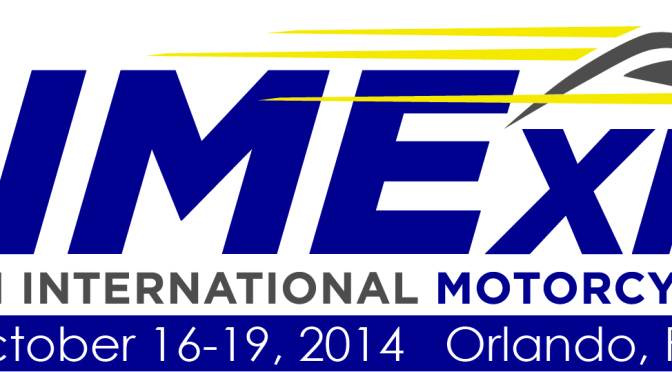 The time has come again for the second annual AIMExpo in Orlando. 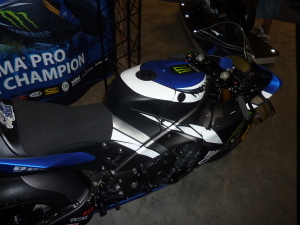 Last year was an excellent first show with Yamaha and Suzuki showing great support by having gorgeous displays. 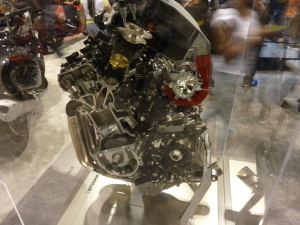 In addition, there were countless parts and gear vendors, motorcycle communities, and smaller manufacturers showing their latest innovations. 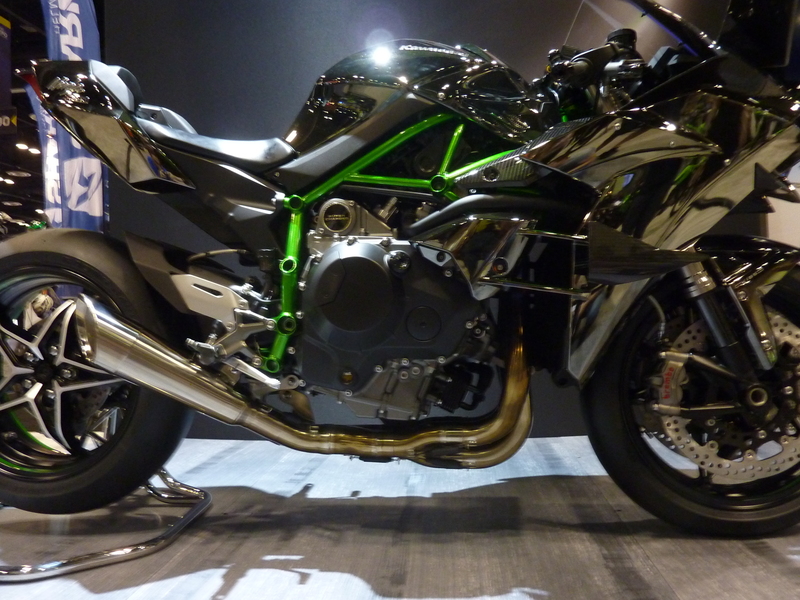 This year adds Kawasaki to the list of major manufacturers and the likelihood of the public unveiling of the street-legal supercharged H2. I can’t wait to check it out in person. The Fall season also brings with it a new unveiling of 2015 gear. I’ll be checking out all the new helmet designs, jacket styles, and color combinations that everyone will be bringing to the show. Stay tuned next week for some lists, finds, and news from the show. It is a great event to kickoff this blog with loads of information to sift through and post about. I’ll be taking many pictures and trying to get a look at everything. Is there anything you’d like to specifically see? If so, post in the comments what you’re interested in and we’ll be sure to check it out! When choosing all the proper riding gear we always focus on the obvious kit: boots, pants, jacket, gloves, helmet. But perhaps the most overlooked component is one that can actively save you from damage on every single ride – earplugs. Whether running stock exhaust or tearing down the roads with a less restricted aftermarket system, the ride is likely to be loud. Even at highway speeds, the wind noise is enough to be damaging. Noise Induced Hearing Loss (NIHL) can happen around 85 decibels or more. For reference, city traffic is about 85 decibels, and motorcycles are around 95. That is likely to be higher on group rides when you’re riding among many other riders, some of which likely have louder exhaust systems. 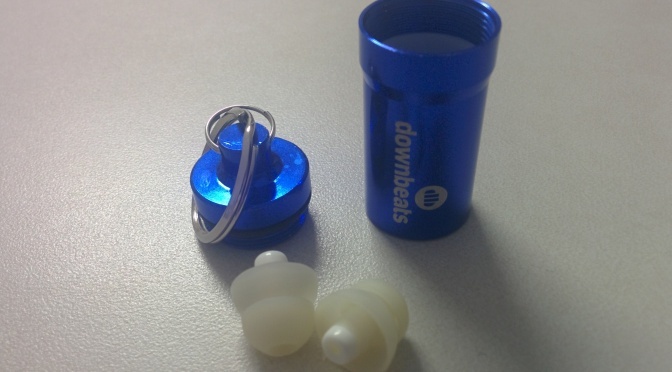 Recently I bought a pair of reusable ear plugs to keep with me when riding. I find that it cuts down enough of the “noise” of riding while still letting in enough sound to enjoy the roar of the engine and the various aural elements of the ride itself. In fact, I believe the ear plugs actually enhance the engine sound similar to a live concert, where the noise from the volume takes away from the individual sounds of the instruments. The ear plugs also do a great job of letting me hear emergency vehicles and surrounding traffic enough that I can still be aware of my surroundings, which is very important when riding. So, if you do not already have and use ear protection while riding, I highly encourage considering a set of ear plugs. While you likely won’t get hurt on every ride, you will certainly do lasting damage over time without proper ear protection.